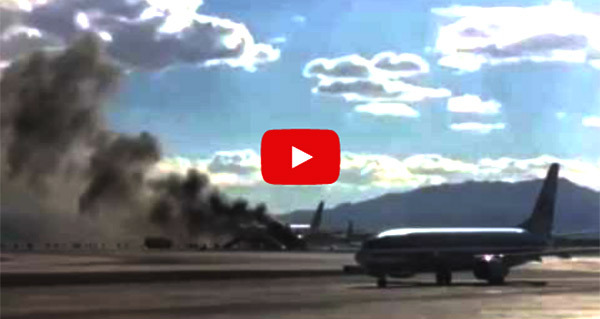 A British Airways plane bound for London was preparing for take off at McCarran Airport in Las Vegas when it suddenly burst into flames. There were 172 people —159 passengers and 13 crew members— on board when the blaze allegedly caused by engine failure occured Tuesday night, September 8, 2015. Various reports online say the Boeing 777 aircraft was filled with smoke while passengers hurried towards the exit door, jumped on the evacuation slide, and ran away from the fire. Two persons who suffered minor injuries were rushed to a nearby hospital for treatment. Terrified travelers from other flights took videos of the blaze. British Airways is expected to release an official statement soon. Authorities are reportedly gathering more information on what caused the fire.